Some days I feel like there is nothing that needs to be done in particular. Whether its marketing, the business plan, finances, cash flow, collecting money, etc., there never seems to be a timeline on getting some of these things done. But when you take a moment and look from 50,000 feet at what you have to accomplish before you sell your first beer and HOLY CRAP, there is a lot to do. All of this means that starting a business, and in particular this brewery, results in having a lot on your mind. I’m not talking about when you are in the shower, or making dinner …. I mean in the middle of the night, or when you should be engrossed by something else like a CFL game, or the company of a great friend. It is so easy to let thoughts of your business, and the work that is undone, creep into your mind and send you on the path of mental anguish. Tonight is a great example of that. I would like nothing better than to sit down and turn my mind off the task at hand, but there are a few things on my mind: I have a Brand Guide that needs attention, emails to investors to follow-up on progress, work with an architect on the space we are trying to lease, a meeting on Monday with our Accountant to prepare for, documents that our Lawyer needs returned, emails that need to be answered, a business plan that needs to be updated before it is PDF’d, decisions on equipment that need to be made, more requests sent to suppliers and manufacturers for additional quotes, contractors that need to be interviewed for work required, and most importantly this blog which needs to be attended to (I will get a check on that after this). All of this makes me realize that Entrepreneurs are both made and born. You have to like the chaos that comes from this process …. the constant juggling and prioritizing of tasks, working in the trenches, while at the same time, working like a VP, and the constant struggle between what you really want to do, and what the market wants you to do. You also have to be able to turn it off, and it is something that requires constant reminders of this. So with the end of this blog, I am going to make a to do list for tomorrow, and turn-off my mind. I am reminded what one of my good friends and mentors tells me …. starting and running a business is a marathon in that requires a balance of running harder to stay ahead of things and laying back to regain some strength. Tonight might be some time to regain some strength. This entry was posted in The Journey and tagged BC, Business, Business plan, Cash flow, Consulting, Entrepreneur, How to start a Craft Brewery, Im Starting A Craft Brewery, Just another guy starting a brewery, Marathon, Small business, Starting A Craft Brewery, The nameless brewery, Time management, Vancouver on September 29, 2013 by locuswest. Well if needing to raise $1.2 million dollars isn’t enough of a mountain to climb in order to open a brewery, don’t forget the line of credit of about $250,000 you will need to keep your operations solvent until you break even on a monthly basis. For our operations, we are projecting about 16-18 months before we break even. When you really look at the reality of opening a brewery, you almost think it would be better to head down to the River Rock Casino and see if you couldn’t do better than owning a brewery. There is one major way to mitigate the risk associated with starting a brewery: Lease your capital equipment. It is a novel idea that can amortize the capital cost of equipment over a longer period of time, and help ensure short term liquidity during the crucial first few years of owning a brewery. Spread the cost of the equipment from upfront when you have zero revenue, to a time period when (in theory) you have good revenue in order to pay for the equipment. At the end of an equipment lease, you own the items you leased. There is no payment like with a car, you simply own the stuff you bought. Over the course of a lease, you spend about 5% of the total amount owing per year in payments to someone else, which can add up quickly when you are looking at $500,000 in leasing. I am sure there are other points for and against leasing equipment. When I spoke with my accountant, he said something that stuck with me, and I hope to keep in the forefront of my mind when it comes to this kind of thing: Do whatever makes your cash flow better. Simple enough right ….. well not so fast. Like everything in this process, and I sound like a broken record, there is a decision to make. Sacrifice better cash flow in years 1 and 2 for worse cash flow in years 3 to 5. Or vice versa! It seems to be a universally known that a lack of cash sinks businesses. Cash Is KING! Well, under that scenario, a lease agreement seems to make logical sense. So into my cash flow I went, and put in leasing equipment, and voila out popped the results! Enter dramatic music here …. It didn’t work out as well as I thought it would. In fact, it saddled operations down the line with those extra payments, when that cash (and lost money on interest) could be better allocated to other facets of the business. Help! I have a meeting on Monday with our accountant, and I hope to get his expert advice on what we should do. I wonder which way he will go? Do you have an opinion? In my opinion, I think we will lease some of our equipment, but at this point I don’t believe leasing all of the equipment is worth it. The $10,000 per month in lease costs help in the short term, but not the long term. One thing is for sure …. its just another decision to make, and one that is crucial to ST and LT success of the brewery. This entry was posted in Business Side of Things, Financial on September 27, 2013 by locuswest. When to quit my paying job for one that costs me money? One thing that I tended to overlook was the transition from working at my current job, to working at both jobs and then making the jump to the brewery full time. It is a delicate balance, and one that had its ebbs and flows, so it can be a hard thing to judge when the right time is to make the move. My journey started about 5 years ago, when I just couldn’t shake the dream of wanting to start a craft brewery. I have always been an entrepreneur and at various times in my life, I have tried starting businesses, intermingled with jobs working for corporations, other entrepreneurs and multi-nationals. There was the Crepe restaurant that I tried starting during University with my good friend, an advertising company we tried starting after University, and a destination based travel company I tried starting in the late 90’s. All didn’t get off the ground, and looking back on those experiences, I am glad, as they would have likely prevented me from following this passion. It was about 5 years ago that I needed a work/life plan to start a brewery. I knew that there is a whack of work involved in starting a brewery, a lot of cash needed, and often that work revolved around times that were inconvenient to having a 9-5 job. Most importantly, I knew that you couldn’t stop doing everything in favour starting a craft brewery, as the road to opening your doors is several years long, and that means no salary for a long time. So I wrote my real estate exam, and became a realtor. It was a tough few years, one that made me question what I was doing to my family and my life that seemed so normal and easy up until that point. You see our life was comfortable. Both my wife and I worked for large companies, which meant we brought home regular income, and had for the most part 9-5 jobs M-F. Well when you get into real estate it is often the opposite of that. Evenings and weekends, and work is excessively seasonal in the Spring and in the Fall. This can be a real challenge when you have kids and friends who work in other M-F 9-5 jobs. But it was my dream to start a craft brewery, and as such I thought the best way to have flexibility to start a brewery was to be a realtor, as the hours were flexible, there were some great skills I would learn, and it would provide me a little cash to pay for some of the expenses along the way. Having walked this path for the past 5 years, there have been many highs and lows. At the end of the day, there is no perfect job to have when you are looking to start a brewery, and depending on your situation, there are likely a variety of options that are best for you. I have found the flexibility with my schedule and complimentary hours a positive in working real estate, and the lack of regular income and seasonality in work required with real estate the biggest challenges. So all of this leads me to question when I should quit my real estate career in favour of working for the brewery full time. The sooner I move to the beer business full time, the better my business will be prepared and planned. The flip side is the longer our family will have to go on one income, and the greater the stress on my wife and kids. I really don’t think there is an answer to this question, but I do feel like I am getting close to that point. The 60 hour work weeks used to be enough to fit everything in, but now they are insufficient. The space we are looking at leasing is requiring a lot of work and attention to detail, not to mention money. I can see all of this leading to a point where I will be exhausted, broke, and likely as happy as a kid in a candy store. I hope that I have the wisdom to make the right decision on when to break away from real estate, and focus on the brewery. It doesn’t feel quite right yet, but I expect by the end of the year, when we have our space leased and operations set for a grand opening in 2014 sometime, the right time will emerge. This entry was posted in Business Side of Things and tagged Beer, Brewery, Business, Canada, Craft beer, craft beer BC, East Vancouver, Entrepreneur, Food and Related Products, Im Starting A Craft Brewery, Microbrewery, Real Estate, Starting a brewery, Vancouver on September 17, 2013 by locuswest. What is under the floors? One of my recent posts discussed the floors in the building we are looking to lease. You can read it by clicking here. Essentially, the floors are in need of some repair and upgrades, and we are going through the process of figuring out how much it will cost versus what we have in the budget. When I look through our financials, we have a set amount of money to spend on pouring cement, upgrading floors and making changes to the foundation. If we want to spend more money than is in this pot, we either have to take it from somewhere else, or we have to raise more money. Raising extra money is not ideal for 1 main reason. If you indicate to investors that you are going to need $1,000,000 to start, and you value your company based on that, it is hard to go back to them and tell them that the shares they thought were worth $1.00 each, are now worth something less, like $0.80 each. Given this, we have raised what we think is a realistic number and based our valuation on a few worst case scenarios. Hopefully only a few of these come to fruition, and you are left with a little extra cash to spend on items you were off in your estimates. So all this leads to our floors: We have about $75,000 for flooring in our space, and after what we found out today, it is likely going to be a little low. So where to take money from? The only logical place is either wages or marketing. That means either I am going to have my salary delayed even longer, or we are going to rely on word of mouth for advertising. Neither option is ideal, but what else can we do? We can’t cut equipment costs, and god forbid we cut our raw material costs! Anyhow, we cut and opened the floors in our space, and I wanted to share those pictures. As you can see, we had to cut the floor in order to see what’s below. 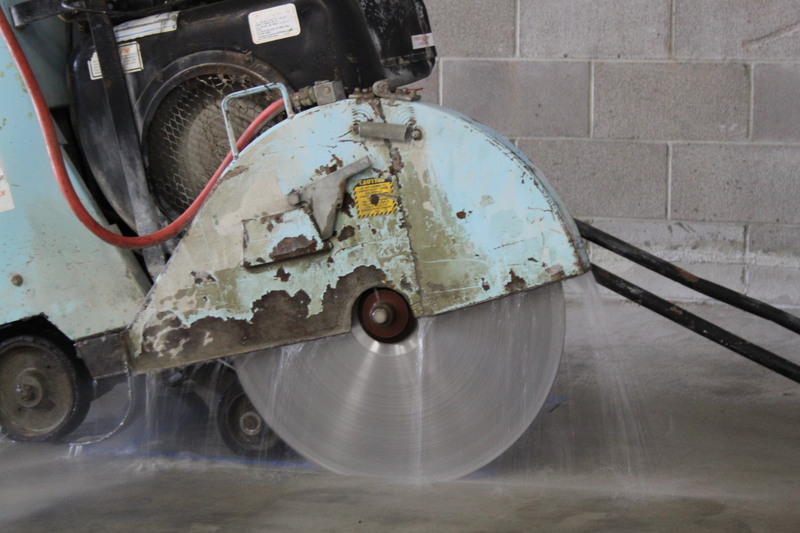 Here is an action shot of the machine in use. You can imagine how loud this bad-boy was. It did the trick and gave us a nice little .75 metre x .75 metre section to see below. 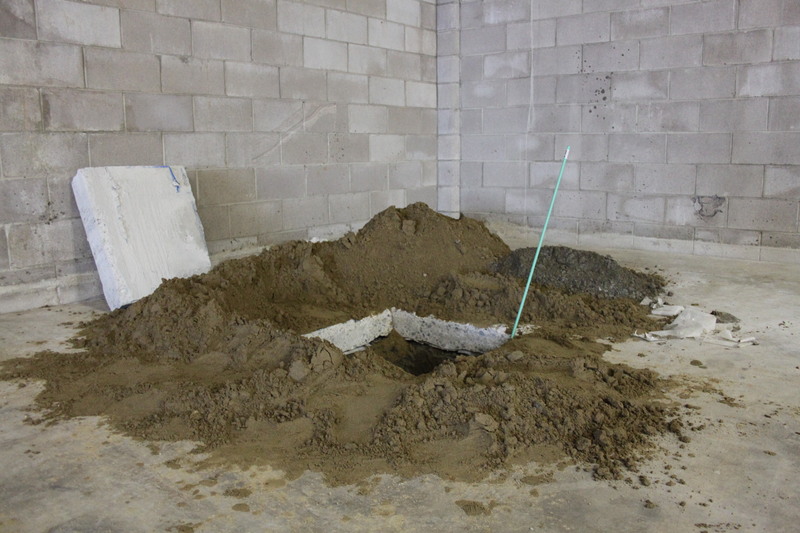 Here is the hole at grade. 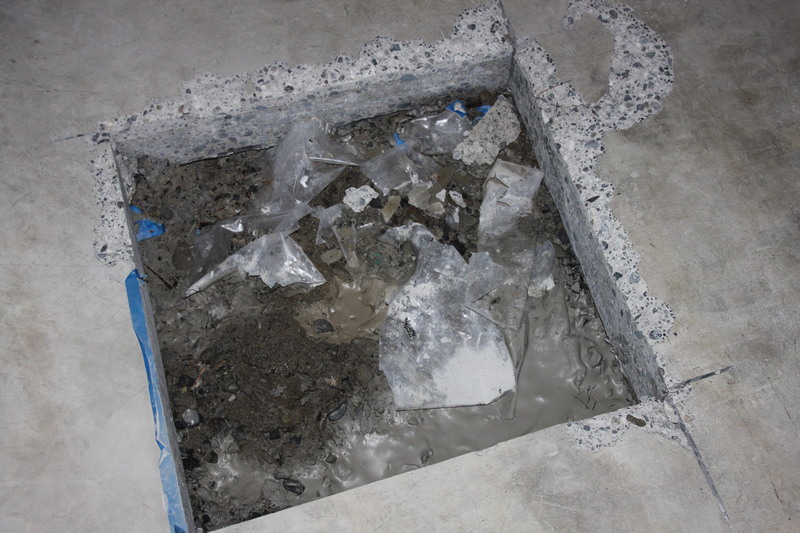 It looks like there is a gap of about 5 cm’s between the top of the substrate and the bottom of the slab. In other words, there is nothing holding up the floor …. it is essentially a suspended slab = Not Good! I dug for 2 metres and still couldn’t find hard ground. Shovelling the last of the dirt out was next to impossible , not to mention how dangerous is was being in such a deep hole, so I could dig no further! The next step is to use the probe and see if you could hit solid ground below. 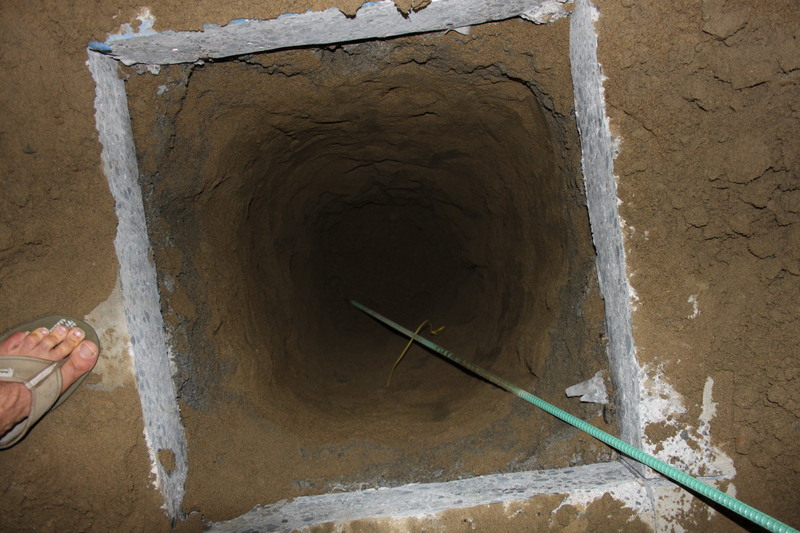 OK, so we went to the bottom of this 2 metre deep hole with the probe, to see if we could hit solid ground. The probe went down and down and down …. all 2.5 metres of it. There was no solid ground to be found …. WTF. 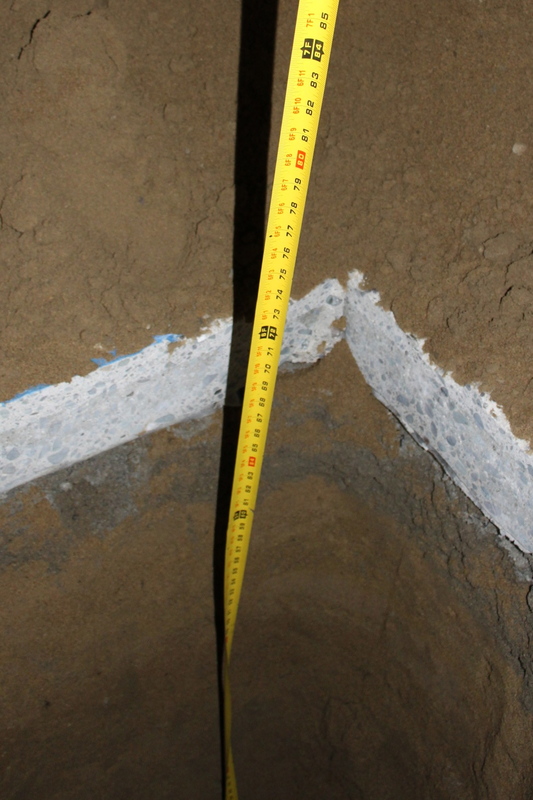 So what this means is that there is about 4.5 metres of fill under this slab, with no sign of firm ground. This is very upsetting and something we were really disappointed to find out <insert sound of air leaving a balloon>. What does all this mean. Well like everything else with opening a brewery, it means likely more money and time, and it will also mean that we need to re-evaluate this space. If the potential cost of fixing these floors is much beyond our budget, we won’t move ahead with this space. So now we will wait for the Geotechnical Engineers report, in addition to the Structural Engineers report, but at this point, its not great news. As you can tell, everything is resting on these floors. This entry was posted in Brewhouse and tagged Business, Concrete slab, Floor, Geotechnical Engineers, Im Starting A Craft Brewery, Starting a brewery, Structural engineer, Substrate on September 11, 2013 by locuswest. There is a delicate dance involved in negotiating a space for our purposes, one that I have become too familiar with from the failed negotiations of spaces we desired in the past. The dance revolves around meeting the needs of our business, juxtaposed with the needs and desires of the landlord, with our selfish desire to open the brewery sometime before this decade ends. When a deal favours one party measurable more than the other, a deal is usually not going to come together. However, when both parties are reasonable and take a collaborative approach, there is hope for a deal to be struck. 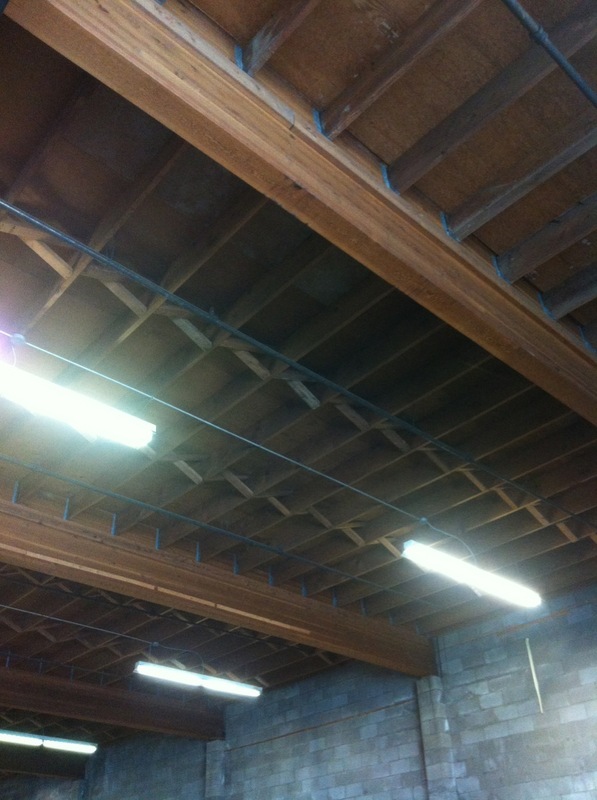 A sneak peak of the space we are looking to lease. The landlord that we are currently negotiating a deal with is one of the most fair, trustworthy and understanding landlords we have come across so far on our journey. Compared with some of the landlords we have dealt with in the past (we have tried to secure a space for over a year), he is a breath of fresh air. Let me give you an example of how the other half operate. About 6 months ago, we came across a property not far from Coal Harbour Brewing, Powell Street Brewing and Parallel 49. It was a great space that was inspiring, unique and located near these other breweries, so it would help to keep our tasting room bus. We acted quickly, and within 2 weeks of this property being on the market, we viewed it 2 times, had our architect visit and perform a code review, and we were in and out of the City of Vancouver asking questions and understanding the space. Before we made our offer, the landlord’s realtor and our realtor discussed the basic framework of the deal, and everyone seemed to be on the same page. So we made our offer …. and this is where things came off the rails. The landlord changed his mind about a few of the key details, like increasing his asking price, the amount of work he would do and the terms of the lease after we made our offer. So we pondered his change of heart, and decided to go back with another offer reflecting his change of position. The offer was very generous and gave the landlord everything! In other words, all the changes he asked for we decided to offer. We expected to have a deal once he read our new offer. Well wouldn’t you know it, he changed his position again. This time, he told us he was not going to pay for any freight elevator upgrades, when he told previously he would. In short, he got greedy. So what did we do? We walked. Yes that space was perfect, and yes we would have been successful in that space, but at the end of the day, we didn’t want to deal with a jerk on a regular basis. It was tiring and too emotional dealing with him, so we moved on. And are we ever glad that we did move on. Now we are looking at a better space for our operations, with a landlord who is willing to work with us, instead of in opposition to us. The stress and emotion have left the process, and considering all the stress involved in starting a brewery, this is a good thing for my life. Without putting a jinx on us <touching wood>, we are in the final stages of negotiating with this landlord. We hope to work out a deal, and with a little more exploration and understanding of this space, we will hopefully sign-off on a deal in the next few weeks. We are optimistic, but if our past experiences have helped us understand this process, we won’t be overly alarmed if it falls apart. A deal isn’t a deal until the cheque is signed … and probably clears at the bank. On Monday, we will be getting a look under those floors, and hopefully take a huge step to towards finding a dancing partner. This entry was posted in Brewhouse on September 6, 2013 by locuswest. Everything rests on the floors … Literally! When you start out with the dream of opening a brewery, there are a bunch of things that you dream about. For instance; where you are going to brew your beer, what your brand will look like, how good it will to be your own boss, and most importantly what kind of beer you are going to brew. Further down the list, you think about other details like cans vs bottles, unitanks vs fermenting & conditioning tanks, or what kind of delivery truck you are going to have. Then there is a bunch of items that you generally don’t give much thought to: When to have your fiscal year-end, do you want your coasters to be printed on one side or both, and who your accountant is going to be. Even further below this is flooring, one of the things you tend to not think about at any stage of starting a brewery, other than when you are looking at warehouses to lease. Well you probably guessed it, we are at that time and place now. We have submitted an offer on a space to lease, and we are currently negotiating back and forth with the landlord. We are hopeful that things are going to move ahead, so we have really started to focus on the details about this space. Important considerations when you think about having a lease for 10 years. You see, a floor in a warehouse is nothing like a floor in a house …. which is the only real reference point I have for this kind of thing. A floor in a house is usually flat, and if it isn’t, you make it flat, put in the flooring and underlay of your choice and voila! A floor in a warehouse is a much different beast. Most importantly, the floor in a warehouse needs to take a load. 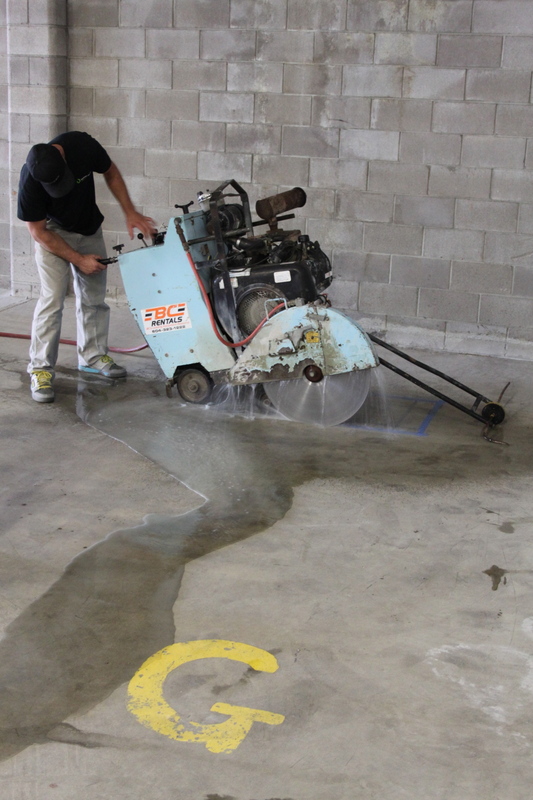 The floors usually have a PSI rating, and that determines how much of a load you can put on the floor. In other words, a higher PSI rating for a floor is a good thing in the world of brewing, as you are putting several metric tonnes of tanks and other equipment onto it. Well the floors in the warehouse that we want to lease aren’t the greatest. They have settled in several areas, and they don’t have a high enough of a PSI rating. This means we are going to have to fix this problem if we lease the space, and that costs a lot of ‘jack’. The most important question we have to ask is why have the floors settled? There are 3 possible reasons for this: 1) The preparation for the floor was done poorly in the first place. 2) There was organic material left in the ground (like old trees and roots), and they have wasted away to nothing causing the floor to settle 3) There is some problem that is slowly washing away the substrate leaving a nothing where there was once material. Well this is the point that we are at now. Do we move forward with the space, knowing that the bill for the floors could be somewhere from $50,000 to $200,000 (and by the way we only have $75,000 in our budget), or do we say everything else seems really good about this space, but the floors are too much of a question mark, so we walk away. This is the question that we are faced with this week. It is both an emotional decision for me (I love the space and want to get this brewery off the ground) and also a business decision (I have to do what is right for my investors). I am hopeful that we have the wisdom and support from engineers and other professionals to make the right decision. As you can tell, the road to starting a brewery is full of pot holes and hazards. But if you can successfully navigate those things, then the reward is greater than most anything else in the world. This entry was posted in Brewhouse and tagged BC, Beer, Brewery, Building Upgrades, Craft beer, Drink, Floors, Food, Im Starting A Craft Brewery, Lease, Microbrewery, Retrofit, Space, Vancouver, Warehouse on September 2, 2013 by locuswest.